Orkidèdatter – FØL VINDEN – FØL STILLHETEN – FØL HJERTET DITT – DET VET. FØL VINDEN – FØL STILLHETEN – FØL HJERTET DITT – DET VET. The Mystery Blogger Award 2019. “Mystery Blogger Award is an award for amazing bloggers with ingenious posts. Their blog not only captivates; it inspires and motivates. They are one of the best out there, and they deserve every recognition they get. This award is also for bloggers who find fun and inspiration in bligging; and they do it with so much love and passion”. Now that I wrote these words from Okoto Enigma I can’t understand that I deserve this award …it’s beyond my understanding, and I am overwhelmed by this. – Thank the creator of the award and provide a link as well. – Ask your nominees any 5 questions of your choice; with one weird or funny question. – Share a link to your best posts. Thank you so much Steve for nominate me for this awards. That’s the second time I get a nomination from you and I’m deeply grateful. Steve is the author behind the blogname Stevescountry. He is a lovely soul with a big heart of gold. Steve, you know I really enjoy your blog and your cat Muffin, but most of all, how much joy YOU fill my heart with when I visit your world. Please do visit Steve and you get a ride in his world you never forget, and the touch with nature is indescribable. 1) I am her who must read a local paper in a paper edition. 2) I am her who has to stretch and brush the bed sheet, shake my pillow and shake and arrange the pillow before I crawl down my bed. 3) I become both sea-sick, car-sick, train-sick and fly-sick. 1) I you had enough food and water for the trip, would you cross the Atlantic ocean in 16 foot (approx. 5 meter) boat? -No, never. It gets too much for me to deal with and not to talk about being seasick …I’m just getting unwell of the thought. 2) If you had the opportunity to live in the world, other than where you are, where would you choose to live? 3) If you had to choose between living 6 months in our cold northern Canadian winter or 6 months in the Sahara desert, wish would you choose? – It was not difficult. My heart is a bit in Canada because of my family there, so I like to stay for 6 months in cold northern Canadian winter. I would love to experience northern Canadian. I love sun and summer, but not too hot, so the desert Sahara is not for me. -Yes, I’m gonna survive 10 days without my phone. Here I live we only have mobile phones so the worst thing is not to call someone, but I don’t call often because here I live is the bad internet too. Sometimes we nor have internet at all..
5) Why did you want to start a blog? I started blogging because I think I was not alone about what I went through and what I experienced from childhood, and up to adulthood. Being able to reach someone with my writings, art and poems and small stories became important to me, and be able to tell you that you are not alone whatever part of the world you come from. When I blogging I can feel deep in my soul that is a healing prosess for me too. 6) Why do you follow my blog? – I love to make a delicious cup of coffee and settle in my favorite place in the living room. Here I open the blog of Steve and I come into his world and get warm in my heart. He writes about his cat Muffin that I think is absolutely adorable and he describes their days. He makes me smile and I just relax with his post. All his lovely pictures make me speechlees. Steve, you give me peace in my mind, thank you. Otherwise see what I wrote about Steve above. 7) Read my answer to question 5 above, what does it mean? 1) Which zodiac sign were you born in? 2) Do you listen to the radio or do you prefer to watch TV? 3) Have you been to Norway and what did you do there? If you don’t, do you want to go here and what do you want to experience? 4) What advice do you give to others in difficult times? And do you live by this advice yourself? 5) If you could choose, which animal would you like to be and why? I hope you all enjoyed this post, I did. (I post this on my account on instagram and facebook). 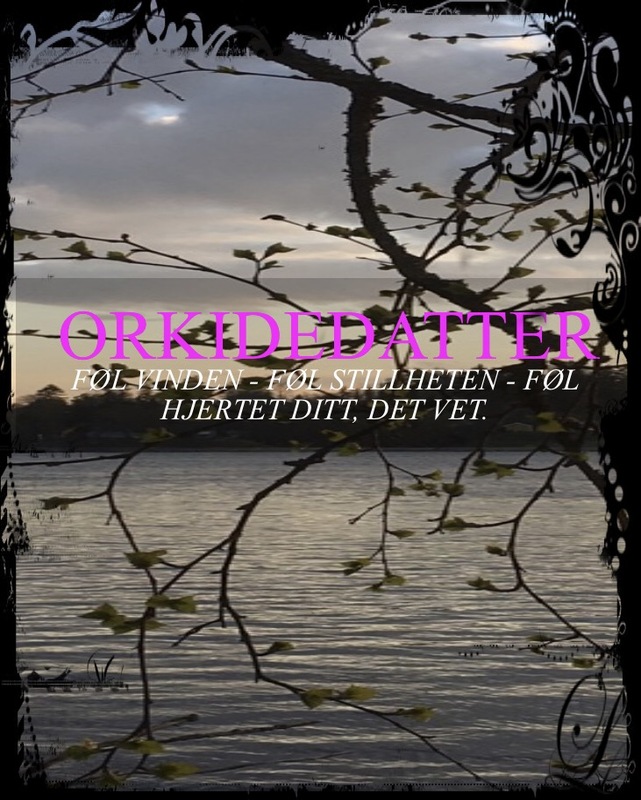 April 21, 2019 by orkidedatter, posted in Min verden. In the mountains far in the big wide tundra she feels small. If Mother Earth decides to shake a little, she has no other choice to join in on what’s happening and let fate determine the outcome. She sees so far the eye can reach, and the sun shines from the most beautiful blue sky. With paper and pencil she has next to her, she lays down in the snow. She makes a snow angel … and embraces herself with the energy of nature. The blue sky reminds her that there is no end, nor any start up there, but a whole eternity. She closes her eyes and feels. Feeling the force of her heartbeat and her Viking blood running in her vains. Her blood bubbles and she can feel the presence of something she doesn’t know. Only her imagination can put an end to her dreams ..
Where the ancestors have settled from the old times it gives her roots from a time she has not seen, but which she can only feel. The meditation helps her to sense the nature and it feels like home. Far down there she can hear the sound of Norway’s longest river. It crumbles, rush and flows like in a rosewood thirst for water. At the end of the long miles it runs into the ocean and becomes one with the world. She feels lucky to experience this. It smells like winter and spring. A summer mood at the bottom of the river where withered leaves turns into grass and moss. Where the little sprouts of the trees and flowers are fighting for life to flourish. Everything will come to life after King Winter’s farewell. She’s finished now, and thanks her spirit and soul, and thanks Mother Earth for this time. She knows she’s coming back in the summer. With a hope to flourish like the mountain in hope and faith. At home in the sunset, she is grateful. She writes it down in a book she calls “Orchid Garden”. Here she fills up the blank sheets with positive things and experiences. She sits quietly until the sun has gone completely down. She can still feel the warmth of the sunset that spreads her colors around the world with a prayer to all of us for love. It’s quiet, only the birds that chirp a jolly song break the silence. Only the trees in her garden whiz a gently good morning and flutter with their big branches so her hair flutters. She always has pen and paper with her, and this time she writes the notes in her mind in the form of a poem and she has her paint brush and colors ready. Time does not always heal all wounds, but I learn to live with the scars .. I natt var du en panter. med glitrende pels og lysende øyne. før du plantet den i det våte underlaget. Du luktet ut i natten. og hoppet opp i nærmeste tre. Øverst lå du og så utover landskapet. Følte på sult, hunger og lyst. Du må drepe i natt for å overleve. Du ble angrepet, knuste kyss og hjertet revet ut. Ingen savn, bare kaldt, mørkt og vått. Stille går du fra stedet. Last night you were a panther. one of the most dangerous. with glittering coat and shining eyes. You can feel the silence. before planting it in the wet surface. You smelled in the night. and jumped up to the nearest tree. At the top you looked over the landscape. Felt hunger, starvation and desire. You have to kill tonight to survive. You were attacked, smashed kisses and the heart torn out. No one miss you, just coldness and darkness. Quietly you go from the place. (English text after Norwegian text). Det var dager og jeg elsket livet. Plutselig ble alt snudd opp ned. Klarer ikke å stoppe det. over meg og jeg kveles. Du fortjener så meget bedre enn meg. Jeg kan ikke stoppe dette nå. Jeg trodde aldri på kjærligheten. Du er perfekt selv om tiden går. du må gå videre nå. Jeg vil ikke stå i veien for din lykke. Jeg klarer ikke å gjøre deg hel og god lenger. Jeg er redd og det gjør vondt. En smerte jeg ikke ønsker å føle på, men jeg må. Du må ta vare på deg. Jeg vet ikke min fremtid. Jeg vet bare min fortid nå. Kan jeg fange deg om du faller? Jeg kan ikke det, jeg er ødelagt. Du må finne en ny trygg havn nå. som er den lyseste og der solen skinner. Jeg er redd. Jeg har mistet grepet. Jeg elsker deg så det gjør vondt. Du må redde deg selv. Jeg vet ikke om jeg kommer tilbake. Jeg vet jeg ikke kan forlange at du venter på meg. Kanskje prøvde mitt indre å fortelle meg noe. Nå må jeg finne igjen magien og mitt liv. Jeg kan ikke la deg bli med inn der. Du fortjener bedre enn meg. Jeg er redd. Jeg er ikke modig. It was days and I loved life. Suddenly everything was turned upside down. over me and I choke. You deserve so much better than me. I can’t stop this now. I never believed in love. You are perfect even time goes by. tears are easier to catch. You have to move on now. I will not stand in the way of your happiness. I can’t make you whole and good anymore. I’m scared and it hurts. A pain I don’t want to feel but I have to. I just know my past now. Can I catch you if you fall? I can’t do, I am broken. You have to find a new safe port now. which is the brightest and where the sun shines. I’m afraid. I lost my grip. I love you so it hurts. I don’t know if I’m going back. I know I can’t demand that you wait for me. Maybe my heart tried to tell me something. Now I have to find the magic in my life again. I can’t let you join in there. I’m afraid. I’m not brave. I am overwhelmed that I have been mined for this price. I am so incredibly grateful for all your, from each of you, to support me. How you appreciate my words and my art I cannot describe. I lose my words, but the feeling in my heart and soul nobody can takes away from me. Thank you so much Steve, who is the author behind the blogg Steve’s country. I love to make a delicious cup of coffee and settle in my favorite place in the living room. Here I open the blog of Steve and I come into his world and get warm in my heart. He writes about his cat Muffin that I think is absolutely adorable and he describes their days. He makes me smile and I just relax with his post. He shares his collections of older things. Something I find interesting and it gives me the best childhood memories that remind me of my grandparents. The muffin is still a little “beauti flower”, and as I realize she has a heart of gold. Thank you Priya, who is the author behind the blogg When an introvert speaks . Her poems and short stories are like a beautiful symphony orchestra in my heart. I dream in moving pictures in my mind and I get a break from a hectic everyday life. Her words captivate me and I cannot stop reading. She creates feelings inside me that I hardly knew I have and that is for me a beautiful experience. She has passion for what she writes and that it is both touching and heartfelt deep in my heart and soul. Please, do visit Priya and you will read words that touch your heart and soul in one way or another. It so beautiful penned. 1. I have long hair and will probably always have it. Have tried shorter hair, but no, I am not ready for it anyway. I mostly set it up in one way or another most often. Can sometimes drop the hair down and have it loose. 2. I’m very clumsy. Is often very unfortunate and can destroy things. Ex: losing a coffee cup in the floor and crushing, at home with me, no, it is so clearly gone by someone else. 5) I love to fire up a lots of light in all kinds of shapes both inside and outside. Fire up the bonfires and sit around this, when day turns to night, talk, and just be in nature. 6) I’m not fond of shopping, but it has to be done occasionally. 7) My zodiac sign is Virgo. Please, feel free to do this Award. I will love to read your 7 things about yourself. I wish you all a great day and happy blogging.